Being Mortal by Atul Gawande: This is number one on my “to-read” list. Hearing a medical doctor finally understand the existential reality of death of something that cannot be “fixed” is so refreshing that I’m not even sure why I haven’t devoured the book already. Basing his thesis on three first-hand experiences—his grandfather’s aging process, his wife’s grandmother’s process, and then his father’s struggle with aging, illness, and death—showed him and shows us how the lived experience changes perception and changes understanding. A Guide for the Perplexed by Werner Herzog: Not to be confused with either Maimonides’ work or E. F. Schumacher’s 1978 book both with the same title, Herzog’s conversations with Paul Cronin appear to display the filmmaker’s characteristic wit and wisdom. In her article on the book, Maria Popova says what we can see from the book is that “Herzog possesses that rare, paradoxical combination of absolute clarity of conviction and wholehearted willingness to inhabit his own inner contradictions, to pursue life’s open-endedness with equal parts focus of vision and nimbleness of navigation” (3). Can’t We Talk About Something More Pleasant? by Roz Chast: Ever since I saw reports of its release, this book has frightened me. How could anyone tell a story about death in the family in cartoon form, in illustration? It seems more paradoxical that I think I may be able to handle. But I know that her cartoons and illustrations are brilliant and insightful so I think I need to face whatever trepidation I have and read this book. I’m betting the payoff will be worth it. Waking Up by Sam Harris: Another book that fascinates yet terrifies me. As a theistic existentialist and having studied many different eastern and western religious practices, I really want to understand his arguments for “spirituality without religion.” Because religion has historically been so central to the meaning systems for so many, understanding how this is shifting is of the utmost importance to all existential practitioners. 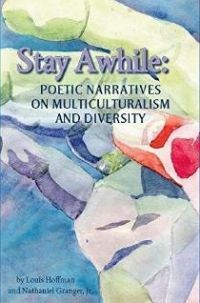 Stay Awhile: Poetic Narratives About Multiculturalism and Diversity edited by Louis Hoffman and Nathaniel Granger Jr.: While this contribution from two members of the New Existentialists should go without saying, I’m saying it. Buy it and read it.